Basal hominins flourished in the Pliocene. In a change from previous terminology, most of these humans have now been referred to Praeanthropus, a little-known genus established in 1948 for a jaw fragment from the Pliocene of Kenya. The various species have been shown to form a monophyletic group by Strait et al. (1997), Wood and Collard (1999) and Cameron (2003) that is distinct from Australopithecus proper (see below). 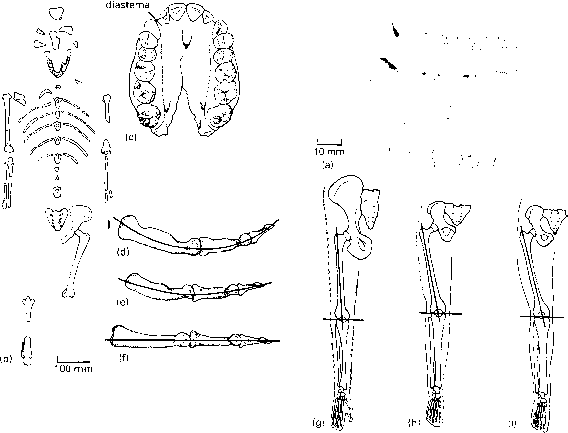 Cela-Conde and Ayala (2003) also include Orrorin within Praeanthropus. These technical disputes have to be sorted out! Leakey et al. (1995) reported an ancient hominin, Praeanthropus anamensis, from sediments 4.1 to 3.9Myr old near Lake Turkana in Kenya, that appears to be an intermediate beween Ardipithecus and later species. The remains include jaws, a humerus, a tibia and isolated teeth. 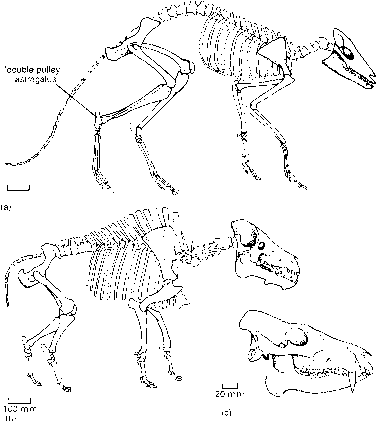 It has a primitive jaw with a shallow palate and large canines. The tibia shows, however, that P. anamensis was a biped. 240 specimens were found at Hadar in the 1970s and 50 new specimens have been found in the 1990s, including a good skull (Kimbel et al., 1994). Lucy is dated as 3.2 Myr old and P. afarensis specimens range from 3.2 to 2.9 Myr in age. Further specimens from Laetoli in Tanzania are dated as 3.6-3.7 Myr old. These include some bones and the famous trackway of bipedal footprints. adapted for a type of bipedal locomotion (Figure 11.9(g-i)). The fuller collections now available show that P. afarensis was a sexually dimorphic species, with males having jaws 30% larger than females. A further hominin fossil is Kenyanthropus platyops from 3.5-Myr-old rocks in Kenya (Leakey et al., 2001), based on a relatively complete cranium. The face is flatter than in P. afarensis and the skull differs in further details, although White (2003) suggests this is most likely a distorted specimen of P. afarensis,whereas Cela-Conde and Ayala (2003) retain the species as valid,but as a tentative member of Homo—quite a divergence of opinion!